According to a recent article by Community Impact News, The Grand Parkway is easing congestion in Tomball. A year after segments F-1, F-2 and G opened to traffic in early 2016, officials said the Grand Parkway has noticeably reduced through traffic in the Greater Tomball area. “In terms of congestion relief, [the Grand Parkway] has accomplished exactly what everyone hoped that it would,” said Marlissa Briggs, executive director of the North Houston Association. The new tollway segments have also brought in significantly more toll revenue to the state. The Grand Parkway received $53.4 million more in toll revenue during fiscal year 2015-16 than the previous fiscal year—largely due to the opening of segments F-1, F-2 and G—according to an annual report from the Grand Parkway Transportation Corporation, a corporation within the Texas Department of Transportation. By the end of FY 2015-16, drivers had paid $83.9 million in tolls across the length of the Grand Parkway. Due to the number of cars traveling on the Grand Parkway, local officials agree the Grand Parkway has not only improved existing mobility but will shape future road projects surrounding it. 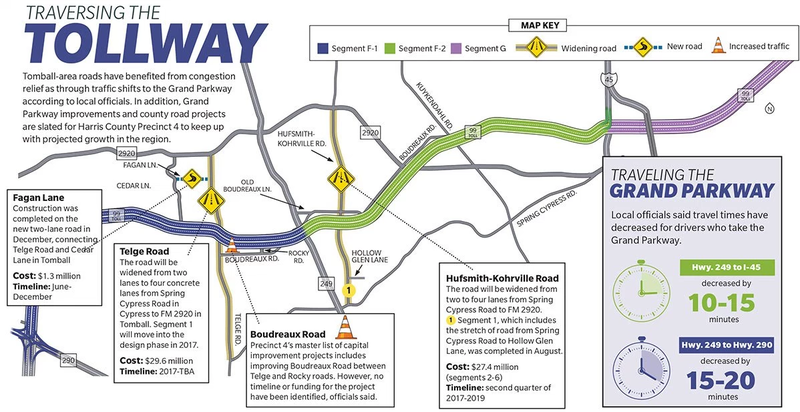 In addition to Harris County Precinct 4 road projects scheduled for construction, direct connectors at Hwy. 249 are also on the horizon, officials said. While some local residents questioned the need for the Grand Parkway, traffic on the toll road’s segments has increased since opening in the first quarter of 2016, said Bruce Hillegeist, president of the Greater Tomball Area Chamber of Commerce. TxDOT has not yet released 2016 traffic counts for intersections near the Grand Parkway, such as Hwy. 249 at FM 2920. However, local officials said traffic has noticeably decreased at major intersections in Tomball since segments F-1, F-2 and G opened. Mark Seegers, communications director for Harris County Precinct 4, said the Grand Parkway segments have eased the existing traffic in the Greater Tomball area, specifically heavily trafficked east-west corridors. “[The Grand Parkway is] a true game-changer in terms of how quickly people can get places,” Seegers said. Seegers said travel times have decreased heading eastward from Hwy. 249 toward I-45 since the Grand Parkway opened, shedding 10-15 minutes off of a previously 30-45-minute trip. “For the people that are heading to the major corridors, it gives them options that [do not] slow everybody else down,” he said. Grand Parkway drivers can get from Tomball to Hwy. 290 in about half the time the drive took on FM 2920, said Darrin Willer, chairman of the board of directors for the NHA. As drivers taking longer trips begin using the Grand Parkway, local traffic on FM 2920 sees the benefit, he said. “I have noticed a marked decrease in the waiting at the [traffic] signals [on FM 2920] because the traffic has shifted over to the Grand Parkway for folks that are doing the through movements, which is exactly what [the Grand Parkway] was intended to do,” Willer said. Hillegeist said mobility at the intersection of Hwy. 249 and FM 2920 has greatly improved as well despite the Grand Parkway’s placement outside city limits. “[The Grand Parkway has] really been an asset and [is] greatly valued by the residents and those visiting our area, because it’s seen as such a convenience in today’s mobility infrastructure,” Hillegeist said. In addition to improving mobility, the Grand Parkway has helped improve connectivity between residents and their communities, Briggs said. Additionally, Briggs said the Grand Parkway has attracted more through traffic, or drivers traveling through an area without stopping, therefore improving safety on lower-capacity roadways and giving local roads a longer lifetime. “That, of course, will help us as a region save on the wear and tear on our roads that were not intended to have high traffic counts,” she said. However, the Grand Parkway has caused increased traffic on Boudreaux Road in Tomball, Willer said. More than 68.5 million transactions—which are recorded each time a vehicle passes through a toll facility, plaza or ramp—were made in total along the Grand Parkway in FY 2015-16, according to a year-end report from TxDOT. Additionally, TxDOT received about $31.2 million more in toll revenue than anticipated in FY 2015-2016—the first year in which toll revenue was collected for segments F-1, F-2 and G.